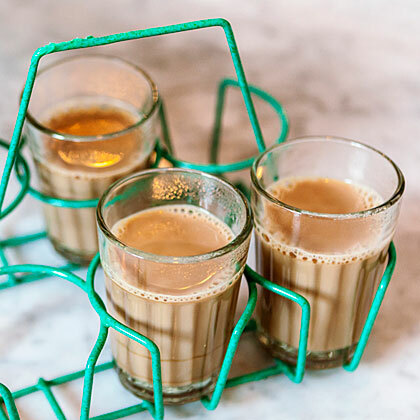 From Badmaash restaurant, in Los Angeles, this aromatic tea, called “cutting chai” in India, is served in small glasses because it’s so strong (“cutting” is the transliteration of the Hindi word for “half”). The black cardamom gives it a smoky, earthy flavor; we recommend starting with the lower amount. Pour 2 cups water into a medium saucepan and add tea and spices. Bring to a boil over high heat and boil 2 minutes. Add sugar and milk and return to a boil. Reduce heat to medium and boil gently 2 minutes, stirring occasionally. Strain and pour into small cups or heatproof glasses. *Find black cardamom in the spice aisle of well-stocked supermarkets, at Indian markets, and at worldspice.com.